Looking for bold and bright horse western saddle pads? Looking for simple every day saddle pads? At SaddleOnline we have an excellent selection of both! Our western saddle pads are thick and sturdy with the perfect amount of softness to properly cushion your horses back. This beautiful black felt pad features brown hair on hide wears with a horse head etching in the corners that create an eye-catching appeal in the arena. 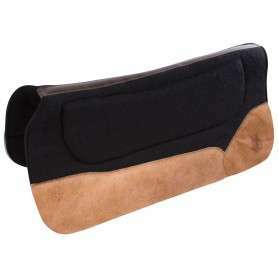 This saddle pad is now on sale for only $79.99 while supplies last! This navy brown pad features complete rigging and stirrups, great for natural horsemanship training and at an affordable price of only $119.99 now! 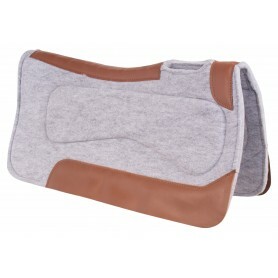 This flexible grey felt pad is the perfect addition for any ranching trail rider! 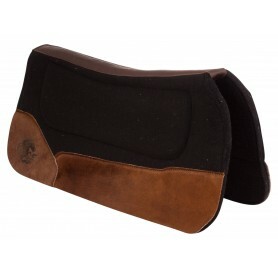 This pad reduces the risk of galling or rubbing, while keeping the saddle balanced. This beautiful black felt pad features a brown hair on hide wears with a horse head etching on the corners that create an eye-catching appeal in the arena.